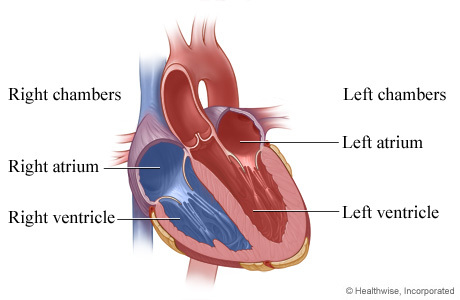 The heart has four chambers: two atria and two ventricles. The right atrium receives oxygen-poor blood from the body and pumps it to the right ventricle. The right ventricle pumps the oxygen-poor blood to the lungs. The left atrium receives oxygen-rich blood from the lungs and pumps it to the left ventricle. The left ventricle pumps the oxygen-rich blood to the body.